Monson: Do you believe Utah’s offense can fix itself? The Utes say it’s going to happen, but given the history here, skepticism is unavoidable. (Chris Detrick | The Salt Lake Tribune) Utah Utes quarterback Tyler Huntley (1) hands off to Utah Utes running back Zack Moss (2) during the game at Rice-Eccles Stadium Saturday, October 21, 2017. Tyler Huntley says everything is going to be OK, that the Utah offense is going to come around as soon as all the engine parts are properly placed and greased and functioning, and that that’s a matter of focus and time, not ability. Britain Covey agrees with him. It’s going to happen this week, they have to have faith that it will, in the short run-up to Saturday night’s game against Washington. “We’re going to have a great week of practice and correct a lot of things we didn’t do well last week. I’m excited. … A lot of it is mental. When you get to the season, you can only improve physically so much. You realize that the mental part is the biggest thing. Helping everyone mentally calm down and focus. They know what to do, it’s just a matter of, when you get out there, where’s your mind at? The Utes, then, are trying to be positive, trying to bend spoons with the power of their minds, sending out positive offensive vibes in all directions, especially inward. The problem with buying completely in and believing is in the Utes’ track record — recent and otherwise. There are flukes and there are trends when it comes to measuring that effectiveness and defectiveness. When it comes to playing good offense as a member of the Pac-12, the Utes have fallen — are falling? — toward the latter, both historically and presently. The latest sampling came against Northern Illinois on Saturday when Utah managed a mere 10 points out of its offense during a game it could have lost had its defense not scored seven itself, rescuing the Utes from an embarrassing loss. Since landing in the conference before the 2011 season, Utah’s scoring offense and total offense have ranked as follows: ninth and 12th, eighth and 11th, 10th and 11th, eighth and 12th, tied for ninth and 11th, eighth and seventh, ninth and eighth. The passing numbers/rankings have been even worse. 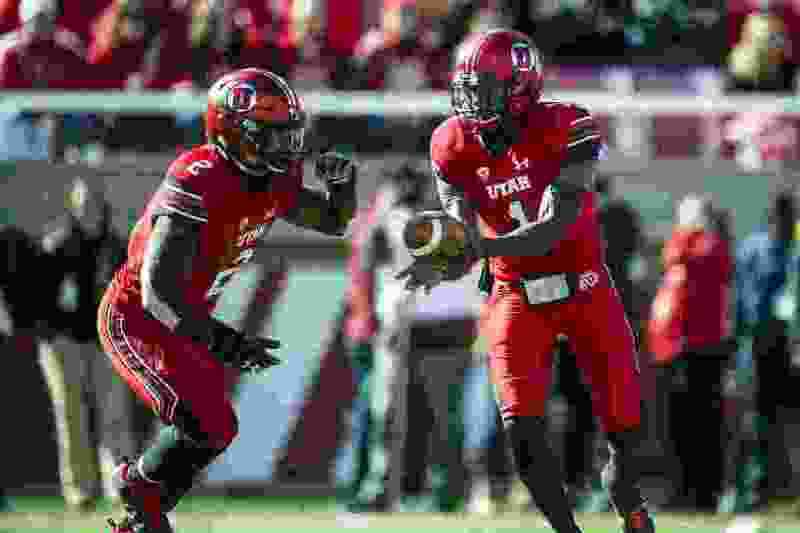 Those results kick you in the face with more force when you check out the way the defense has ranked through the years, causing you to wonder — if the Utes can put up such strong resistance, why can’t they excel in a similar manner on the other side of the ball? It is the shortcoming that has limited Utah in its goal to win the South, an intention it has never realized. Coming into this season, there was real hope that the Utes could ascend to the top. Even the media predicted Utah to finish second. If it’s good enough to be guessed to finish second, it’s not much of a reach to win the thing. Especially now that it’s becoming clear that other teams in the South are struggling, including Arizona, UCLA and USC. Will Utah’s offense again be the hole that messes over the Utes’ chances to do something out of the ordinary? Even with a returning starting quarterback (Huntley), a returning all-conference-type running back (Zack Moss), a returning electrifying force at receiver after a two-year church mission (Covey), and four returning starters along the offensive line? In the days after Saturday’s performance, in which targets were missed, balls were dropped, penalties were committed, QB protection was spotty, run blocking was less than forceful, and with Washington next up, piecing the offense together was what everyone in and around the program was either talking or being asked about. “Drive-killer” was the word most often used by players and coaches to describe failings in the attack at Northern Illinois. Which, translated, is a word that means … dumb mistakes. Let’s say it all plain here: If the offense doesn’t dial in, if it doesn’t smooth its rough edges, if it doesn’t carry its weight, if it loops a hook around the defense and expects that side to pull the Utes’ hopes forward, winning the South will not happen, same as it hasn’t happened for the better part of a decade now. In a season like this, that would be a waste. Is that being too negative? Whittingham seems convinced immediate improvement can be made. “We’ll be ready,” he said. They will have to be.